I don’t know about you, but one of the things I love most about living in Cabo San Lucas is the indoor-outdoor living. With warm weather every month of the year, being outside just becomes a part of life. That’s why it’s important to consider the importance of outdoor living spaces when you’re purchasing property in Cabo. 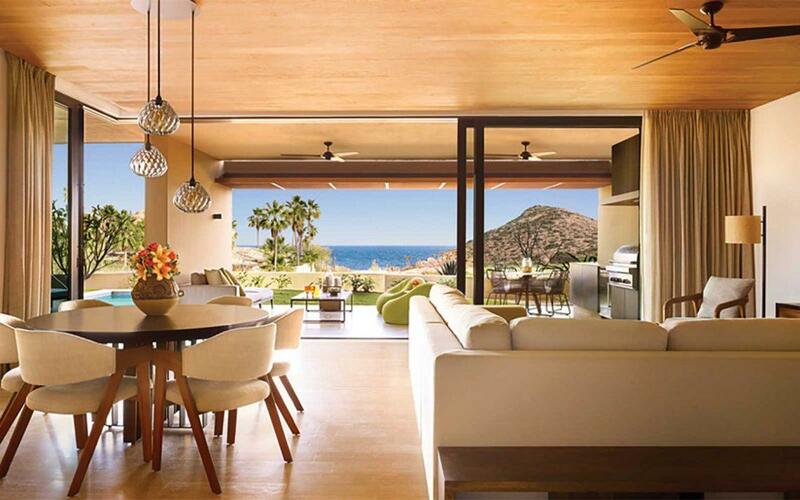 And nothing could be better for indoor-outdoor living in Los Cabos than the Montage Residences. These high-end properties have made the outdoors their manifesto. They’ve even designed the entire property to seamlessly blend into the desert landscape around it. Perched on the precipice of the Santa Maria Bay, the Sea of Cortez laps up against the sustainably-built resort day in and day out. And nothing could be more soothing than being outside to hear it. Each of the Montage Residences feature 1,000 square-feet of outdoor living space (and more than 4,500 square-feet total). The living room is equipped with floor to ceiling windows that open up onto a large terrace with an outdoor kitchen and even a private plunge pool. What could be more relaxing than dinner on the terrace with good friends or an afternoon spent in the chaise? But that’s only the beginning. Because life in Cabo means just about everything takes place outdoors, from the moment you wake up to the moment the sun sets over the water—and even after that too. No one wants to spend time indoors when it’s sunny, beautiful, and hardly ever goes below 70 degrees. That’s why we move here. So we can spend our days soaking up the sun. Beautiful hikes await in this seaside desert paradise, swimming in the pool or out in the ocean becomes de rigueur, and eating is almost always enjoyed outdoors. There’s nothing short of peace and tranquility for miles around, and so we live like it. That’s why when you’re choosing to purchase luxury real estate in Cabo San Lucas, nothing could be more important than ample outdoor space. With more than 10,000 square-feet of outdoor pool area, a swim-up bar, and outdoor bars and restaurants, the Montage Residences have planned every inch of their existence so you can enjoy indoor-outdoor living at it’s finest. Even indoor spaces look out onto the tropical landscape below. Elegant stand-alone bathtubs face floor to ceiling windows for a view of the palm trees swaying in the breeze. If you’re interested in purchasing luxury real estate, look no further than the Montage Residences. Opening this spring, the Montage has the absolute best in indoor-outdoor living in Los Cabos. Contact me, buyer’s agent for the Montage Residences, for more information while properties are still available.